Did I scare you with my crazy organizing post? I could say that I had a week off and didn’t know what to do with myself, or that I lounged around for two days and caught up on all my blog reading, or I wanted to get all the decluttering done so I wouldn’t have any excuses not to sew uninterrupted. Well all of the above is true. Does that make me normal? The next big dilemma in my life was what to do for a new year’s resolution. There are so many choices. I read about a gal that committed to exercising 1 minute a day. Makes sense. You have to get started somewhere was her theory and setting the bar so low as a minute, she certainly could exceed this. It was all about getting started. I really wanted to commit to making 1 pillowcase a day for the million pillowcase challenge, so I am GOING to MAKE one a week. The bar may be set too low on this one also but I can go no where but up. I see all the blogs that have a picture a day, man oh man, I wish I was that talented, creative and disciplined to do that. I did find a cool app, Photo365 that I am playing with. This is what the website says. Photo 365Version 1.0An app that remembers your year one photo at a time. Add a picture from the camera or albums. Save multiple photos in a day. Share your pictures on Facebook, Twitter, Flickr or e-mail. 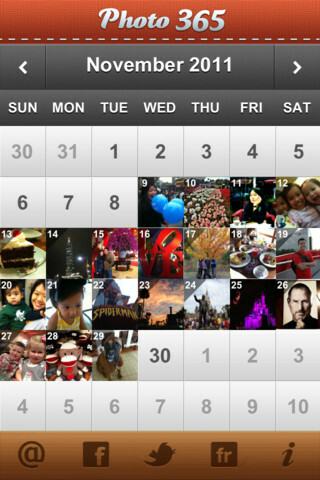 View your photos by the month. This will be fun to add a picture for peoples birthdays, special events, etc. The creative part will come in when I need to add a picture for a date like today, January 3rd. Well worth my .99 investment. There are so many other resolutions I could or should make but this is the one I have chosen for 2012. Resolve to make at least one person happy every day, and then in ten years you will have made three thousand, six hundred and fifty people happy, or brightened a small town by your contribution to the fund of general enjoyment.